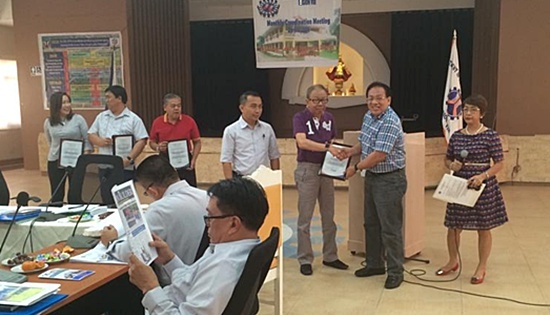 District Engineer David P. Adongay, Jr.(wearing blue stripe polo shirt) receives award as 2nd place in the information, education, and communication program in 2015 from Regional Director Rolando M. Asis on April 10, 2016 at DPWH Regional Office, Baras, Palo, Leyte. The award was given to the top 5 performers in Eastern Visayas Region who has submitted the most number of reports in support to the information, education and communication program of the Department in 2015. BILIRAN – The Department of Public Works and Highways -Biliran District Engineering Office was recognized by the DPWH Regional Office VIII as 2nd place in the most number of Communication Development report in Information, Education and Communication Program in the Department for the year 2015. The award thru the plaque of recognition was bestowed to District Engineer, David P. Adongay Jr. on April 14, 2016 during their monthly coordination meeting held at DPWH Regional Office, Baras, Palo, Leyte and was presented PIO Designate Engr. Rosario B. Rosete, Engineer II and to her Alternates, Engr. Gene F. Delfin and Ms. Chelsea C. Quijano on April 18, 2016 at DPWH-BDEO during their flag raising ceremony. The District Engineer emphasized that the award was the result of the hard work and cooperation of everybody. “Instrumento lang ako niyan, at yan ay hindi ko magagawa without the cooperation of each and every one of us,” said Adongay. P.I.O Designate, Engr. Rosario B. Rosete also expressed her gratitude to all who contributed for the Communication Development Report. “This is all our effort, without your contributions hindi natin ma-aarive ang ganitong accomplishment.” emphasized Engr. Rosete. The award was given to the top 5 performers in Eastern Visayas Region in recognition of its consistent effort to submit the most number of reports among the District Engineering Offices of Eastern Visayas Region such as newsletters, news clippings, media monitoring action, flyers, briefing materials, lobby board display, annual accomplishment, special reports, project inspection reports and other important information materials in support to the information, education, and communication program of the Department in 2015, as the citation reads. In 2014, DPWH- BDEO was also haled 2nd in the most number of Communication Development Reports submitted. Completed construction of Bagongbong Flood Control (Revetment) along Biliran Circumferential Road, Phase II, Almeria Biliran Province. The project was completed on April 15, 2016 under Chu Construction with a contract cost of P7,702,003.68. BILIRAN – The Department of Public Works and Highways (DPWH) -Biliran District Engineering Office (BDEO) are now fast-tracking the completion of 12 flood control projects in Biliran before the start of the rainy season. According to District Engineer, David P. Adongay Jr., it is during the rainy season that flooding may likely occur. As of April 30, 2016, out of the 12 flood control projects implemented under the 2016 Regular Infrastructure Program, 6 were already completed while remaining 6 are on-going. The completed projects are the Mapula Flood Control along Biliran Circumferential Road, Caibiran, Biliran; Bagongbong Flood Control (Revetment) along Biliran Circumferential Road, Phase II, Almeria, Biliran; Bool Flood Control (Revetment) along Biliran Circumferential Road, Culaba, Biliran; Madao Flood Control Structures along Biliran Circumferential Road, Kawayan, Biliran; Tucdao Flood Control along Biliran Circumferential Road, Kawayan, Biliran; and Calambis Flood Control along Biliran Circumferential Road, Caibiran, Biliran. Adongay said that they are availing the good weather condition to finish the construction of all flood control projects which has a total appropriation amount of P174 million. He also disclosed that the remaining 6 projects are target to be completed in the month of June, 2016. To date, the Flood Control Projects has an overall project accomplishment of 66.40% which is high as compared to the target accomplishment of 60% for the month of April, 2016. The completion of the project will help protect the lives and properties of the residents nearby, the hectares of rice fields and at the same time protects the existing Bridges and National Roads within its vicinity. Moreover, another 4 Revetment projects under the Local Infrastructure Program are already completed which are composed of the P5M Revetment in Sitio Cogon, Brgy. Calumpang, Naval, Biliran; P10M Revetment in Sitio Lomboy, Brgy. Calumpang, Naval, Biliran; P5M Revetment in Anas, Brgy. Agpangi, Naval, Biliran; and P5M Revetment in Anas, Brgy. Atipolo, Naval, Biliran. 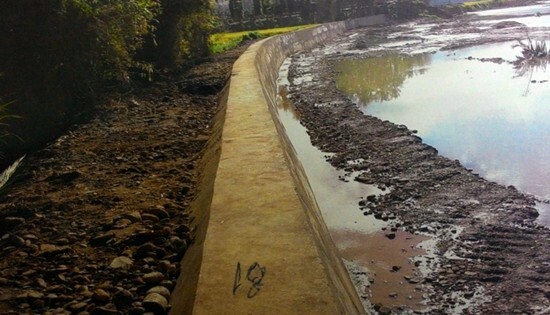 Revetment is one type of flood control structure for protection of the riverbank from collapse brought about by erosion scouring and riverbed degradation. Adongay added that the remaining projects are also being fast-tracked and were closely monitored to ensure quality of projects. BONTOC, Southern Leyte – As the Department of Agrarian Reform (DAR) prepares the agrarian reform beneficiary organizations (ARBOs) to be globally competitive, the former launched in Barangay Buenavista in this town early this month the second farm business school in Eastern Visayas. DAR Regional Director Sheila Enciso disclosed that this project, in partnership with the Department of Agriculture thru the Agricultural Training Institute, the local government unit and the concerned ARBO, is among the various support services extended to agrarian reform beneficiaries (ARBs) under the Comprehensive Agrarian Reform Program (CARP) aimed not only at increasing farmer’s income, but is expected to contribute also to national food security. Enciso said, Buenavista-Pamahawan ARBs Multi-Purpose Cooperative is fortunate to be included in the 15 ARBOs identified nationwide to be trained on Farm business school this year. Meanwhile, Program Beneficiaries Development Division (PBDD) chief, Melecia Ong, explained during the said occasion that the “school” is an on-site training where the farmers will not only learn about high value crops production, but marketing strategies as well. In farm business school, the farmers are being groomed to be agricultural entrepreneurs, she stressed. 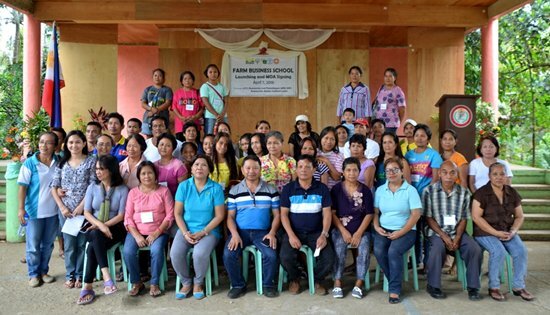 Forty members of the Buenavista-Pamahawan ARBs Multi-Purpose Cooperative have been identified to participate in this training that will run for 25 sessions wherein the participants and the facilitators agreed to meet every Thursday. During the launching, authorized representatives from the DAR, local government unit, barangay council and the concerned ARBO signed a memorandum of agreement in support of this project. Meanwhile, the recipient of the first farm business school in Region-8 that was implemented last year, the Hantag Farmers Multi-Purpose Cooperative, Inc. in Barangay Hantag in Maasin City also from this province is now waiting for the El Niño to end before they start planting anew. QUEZON CITY – Youth groups expressed dismay over the five-page statement discouraging future national leaders from pursuing a free tuition policy in State Universities and Colleges (SUCs). Samahan ng Progresibong Kabataan (SPARK), among the proponents and advocates for greater education spending and free education, cried foul over the “pseudo-scientific, misleading, and profit-oriented” arguments made by the Commission against free education. Buenaagua highlighted that the statement is consistent with CHED’s promotion of deregulation of private HEIs, from the 313 private schools it has allowed last year to increase their tuition fees, to the continued voluntary accreditation process which fails to keep private HEIs from performing at a competitive level. Vitriolo also said that increasing budget for SUCs is easier said than done, especially since basic education remains government's priority over higher education. Buenaagua said that the failure of CHED to distribute over P1 Billion worth of funds to college scholars is enough a testimony that SUC students are the least of their priorities. “What we have seen in the statements of candidates vying for national positions is that free tuition is possible,” said Sanlakas Secretary-General Aaron Pedrosa. “As a response, CHED is defending the government policy to defund state universities and colleges, while leaving the delivery of education to the private sector,” he added. “Unless a paradigm shift happens from a profit-oriented approach to education to a more holistic and liberating approach, public education in the Philippines will continue to lag behind its international counterparts,” Pedrosa stated. Pedrosa noted the double-standard employed by CHED and the Aquino administration, invoking competitiveness when pushing for reforms like the K to 12 program, while refusing to raise government spending to the global standard of 6% of the country’s Gross National Product. Joanne Lim of the Nagkakaisang Iskolar para sa Pamantasan at Sambayanan (KAISA UP) denied that the clamor for free college education is motivated by – according to Vitriolo – a “well-entrenched social prejudice against middle-level skilled manpower” in favor of getting diplomas. “Rather, it is about our freedom as students to choose what kind of future we want to have,” Lim said. “We do not look down on skilled workers, in fact we are disturbed that most people from these sector cannot afford to send their children to college, although they might want to,” Lim argued. Atty. Pedrosa argued against Vitriolo that the free education campaign and greater budget for education is “not just a gimmick. In fact, it is precisely what the Constitution meant when it stipulated that the State must give top priority to education and the vital role of the youth in nation-building,” Pedrosa said. “It is deception to say that the government cannot fund free higher education when it has funded thousands of NGOs through the PDAF scam, and funded the campaigns of traditional politicians who embody this twisted government’s doomed education policy,” Pedrosa concluded. Hybrid pechay, mustard green and spring onions propagated by the 52IB in its Headquarters, Brgy. Caticugan, Sta. Rita, Samar. CAMP VICENTE LUKBAN, Catbalogan City – Major General Jet B Velarmino, Commander, 8ID lauded the 52nd Infantry (Cadre) Battalion under the leadership of Lt.Col. Nedy Espulgar for its Organic Farming Technology at 52nd IB headquarters, Brgy Caticugan, Sta Rita, Samar. Lt. Col Espulgar, promotes a “people centered” organic farm utilizing new farming technology for Citizen Armed Force Geographical Unit, soldiers, nearby communities, civilians and former rebels. The formal launching generated numerous educational tour and camp visit such as the Students of National Defense College, AFP, Elias Canayong, Regional Director of Department of Labor and Employment of Region- 8, Imelda Calagos, Area Manager of Office of the Presidential Adviser for Peace Process (OPAPP), farmers organization from Brgy Mabini and Loog, all of Basey Samar, Pastor Anesito Candole of Palo Christian Church, Zion Bible College and the New Baptist Church, LGUs, LGAs and Civil Society Organizations all over Eastern Visayas. This long-term community based project is a combination of vegetable and herbs gardening, livestock production and aqua culture. On gardening, they propagate high value crops like Chinese pechay, hybrid pechay, mustard green, chili pepper, spring onions. They also cultivate herbs and ornamental plants while on livestock production. They showcased the hog raising (baboyang walang amoy), caber chicken, goat and lamb raising, as well as aqua culture (Tilapia). Generally, it is designed to have self-sufficient detachments and camps in order to lessen the expenses of our CAFGU Active Auxiliary (CAA) and soldiers’ daily food expenses and have an alternate source of income while performing peace and security operation, Espulgar Added. Major General Jet B Velarmino believed that this project can contribute much in addressing the needs of our constituents. QUEZON CITY – "We believe that the Philippine State security forces, with the approval of, if not direct orders from top civilian authorities, deliberately and murderously attacked the protesters, grossly violating the farmers' civil and political rights protected by the Philippine Constitution, law and various international covenants and instruments to which the Philippine Government is a signatory," Karapatan Secretary General Cristina Palabay said. Karapatan, through letters to United Nations independent experts, brought to the attention of the UN Human Rights Council the killing, illegal arrest and detention, and other rights violations against the farmers in North Cotabato during and after the April 1 violent dispersal of 6,000 farmers in Kidapawan, North Cotabato. Karapatan asked for an investigation on the rights abuses against the farmers through Mr. Maina Kai, Special Rapporteur on the Rights to Freedom of Peaceful Assembly and of Association; Mr. Michel Forst, Special Rapporteur on the Situation of Human Rights Defenders; and Mr. Seong-Phil Hong, Chair-Rapporteur of the Working Group on Arbitrary Detention. Karapatan also submitted the full report of the National Factfinding and Humanitarian Mission (NFHM) conducted by the organization, Kilusang Magbubukid ng Pilipinas and Bayan on April 4-6, 2016 in Kidapawan. The report serves as a reference to the complaint filed. Palabay said "it is important that the international community is made aware of these gross human rights violations against the farmers, with all the visible signs of cover-up on the accountability of the Aquino government and the Philippine National Police." The NFFM cited various "maneuvers" by the PNP and the local government to destroy evidence by clearing the crime scene through the use of bulldozers and water cannons, burning of personal effects confiscated from the protesters during and after the dispersal; and preventing paralegals and quick reaction teams from leaving the Spotswood Methodist Center to gather important details and documentation on the incident and provide emergency support to the victims and their families. April 6 - North Cotabato Provincial Board Member Kelly Antao with Lito Palma of the Office of Gov. Emmylou Talino-Mendoza went to the house of the Sulang family. They tried to convince the family not to file criminal charges against the Governor and the PNP and offered P100,000. The family refused the offer. April 12 - At midnight, the Sulang family was disturbed by two unknown men walking around their house until 3 a.m., fearing the men were armed. April 13 - Relatives of the Sulang family received news that members of the Philippine Army are looking for Ebao Sulang. The whole family immediately evacuated and sought refuge from Church and human rights groups. "This is clearly part of the government's underhanded moves to dissuade the family from pursuing countercharges," Palabay stated. Palabay also said that while the 82 illegally arrested and detained farmers have all been released on bail, as of yesterday April 16, trumped up charges of direct assault and frustrated homicide have yet to be dismissed. "The arrest and detention of the farmers – of those who were shot, pulled from the protesters' ranks and tortured by the police, to the elderly and pregnant women farmers, to the mere bystanders – show the inhumanity and callousness of the BS Aquino government institutions on the plight of the farmers," she stated. Among the recommended actions stated in the NFHM report is the indictment and prosecution of all police operatives on the ground responsible for killings, frustrated killings, illegal arrest and detention, and other criminal acts committed during and after the dispersal. The groups also recommended the investigation and prosecution of the President, military and police generals, as well as officials of the Department of Social Welfare and Development (DSWD) and Department of Agriculture, for their participation and complicity in the violent dispersal of the farmers, the various human rights violation committed as a result thereof, and other violations committed thereafter.